Links new mainframe with IBM's standalone servers and blades. IBM has thrown off the covers of its new mainframe system, the zEnterprise, which features new software smarts that allow it to be connected to the latest IBM POWER7 servers and System x blade servers. The zEnterprise mainframe server [pictured in gallery, right], the first of which is the zEnterprise 196, is said to be "up to 60 percent" faster than its predecessor and run up to 50 billion instructions per second. Beyond its performance specs, the mainframe system comes with baked-in software IBM calls the Unified Resource Manager, which enables the mainframe to connect to the latest IBM POWER7 server (running IBM's AIX flavour of the Unix operating system and IBM's PowerVM hypervisor) and System x blade servers (running the Linux operating system and KVM hypervisor). This creates a single, virtualised compute resource that can be managed using IBM's Tivoli software. Mark Binks, system z executive at IBM told iTnews that IBM's new approach should be viewed as "complementary" to a general industry trend toward consolidated systems - be it the Oracle/Sun Exadata 'integrated system' or the binding of clusters of industry standard blade servers using virtualisation software. "This takes it to another level," Binks said. IBM would like to see administrators using Tivoli softare to gain a single view of their consolidated IBM infrastructure, and be able to allocate physical resources to applications via a choice of more capacity on the mainframe or more blade servers. "You can deploy an application wherever the application performs best," Binks said. Binks claimed that many monitoring tools developed for the x86 platform are unable to look beyond industry standard servers (to Unix-based database servers, for example) to monitor an application the whole way through the stack. "Now you can monitor an application from end to end," he said. At present, each zEnterprise mainframe, which boasts over 80 cores of capacity, can connect to 112 blade servers (four chassis). Up to eight mainframes, each with up to 112 attached servers, could then be lashed together to create a computer more beastly than most Australian organisations would require. "But its just as important to note that you can start with a small mainframe, with only one or two cores activated, and connect to a small blade chassis, and move in increments of one," Binks said. Customers of the new mainframe are charged a fee by IBM for each new blade connected to the mainframe system, just as they are for each PowerVM instance. For now, the Unified Resource Manager software that allows for integration between the mainframe and smaller IBM systems is only available on the zEnterprise series, and can only connect the mainframe to the very latest POWER7 server and Systems x blade (PS701). "This is not a one-off investment, this is a strategic piece," Binks said. "We expect continued investment in the system to connect to future IBM blades and appliances." But Binks was unsure of whether IBM will extend the mainframe to be able to connect to third-party blade chassis from the likes of HP or Dell using the same software. "We have tested environment in a consultative fashion, with thirty clients," he said. "If there is a demand for alternative hardware and software, absolutely we will consider it." 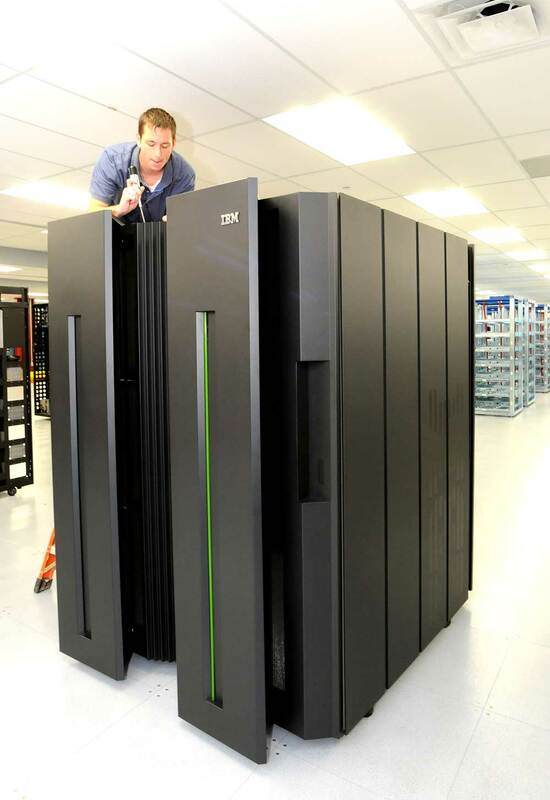 IBM has chosen not to release pricing for its new mainframe. Binks said that "pricing is "unique to each customer" and says he expects IBM to offer pricing bundled with its Tivoli management software. The zEnterprise 196 will be made available to IBM's System z reseller partners.